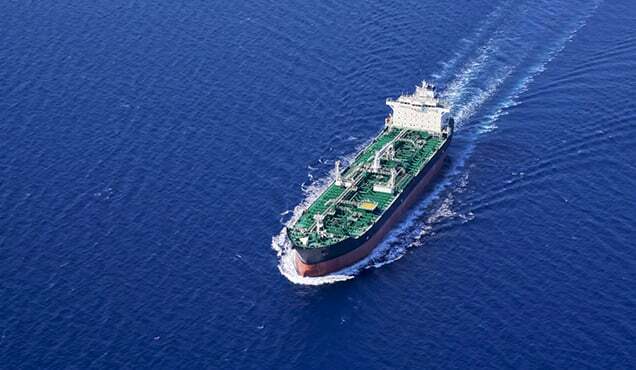 What does Mexico’s deepwater auction mean for the upstream opening? On 31 January, Mexico awarded 19 out of 29 deepwater blocks on offer across three areas – the Perdido area, the Mexican Ridges province, and the Campeche Deep Sea Basin/Salina Basin. 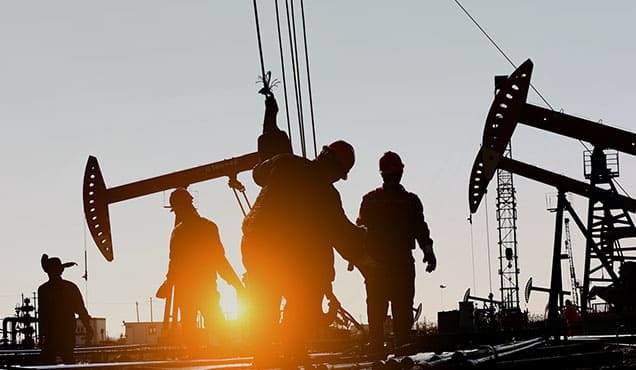 Total work commitments from the 23 wells bid are estimated at USD1.4 billion, and there were two tie-break bonus bids that resulted in a cumulative USD525 million offered to the state. A total of 39 bids were made for the 19 blocks awarded. 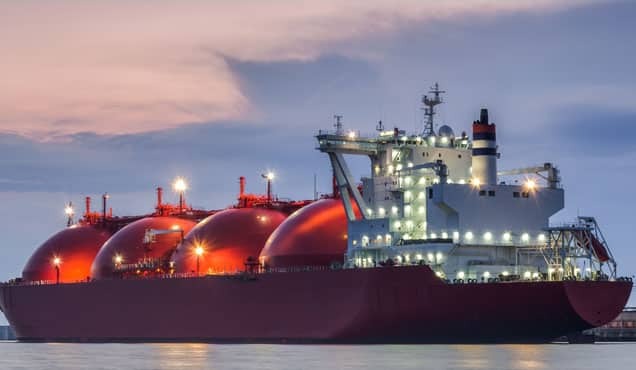 The most aggressive bidders in the round were Shell, Repsol, PC Carigali (Petronas), new entrant QPI (Qatar Petroleum), and Mexico's national oil company (NOC) PEMEX. 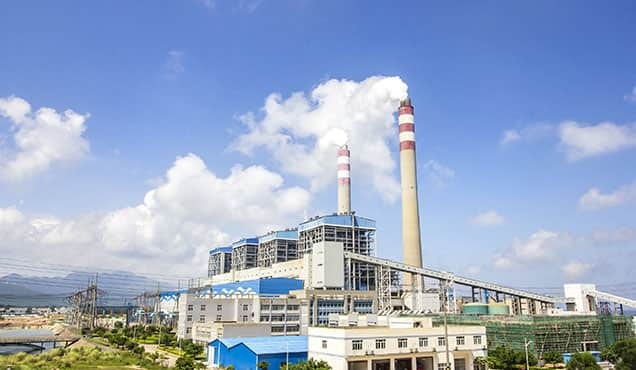 The aggressive bidding of these companies, especially on the part of companies with existing positions, appears to be aimed at seizing a clear window of opportunity to secure material assets under competitive contractual and fiscal terms in order to grow their long-term portfolios in Mexico. IHS Markit assesses that there is a medium risk of a halt on new exploration and production (E&P) opportunities in Mexico over 2018–24, stemming from a potential victory for left-wing populist Andrés Manuel López Obrador in the July 2018 presidential election. López Obrador opposes foreign investment in Mexico’s upstream sector and continues to lead most polls. Even if bid rounds are held through 2018-24, they could be scarce relative to the numerous upstream opportunities offered over the past several years and could feature comparably less competitive E&P terms. Importantly, the Round 2.4 investment commitments – in addition to the investments committed as part of Mexico's previous bid rounds and PEMEX's farm-outs – will help to shore up foreign upstream activity through the medium term. 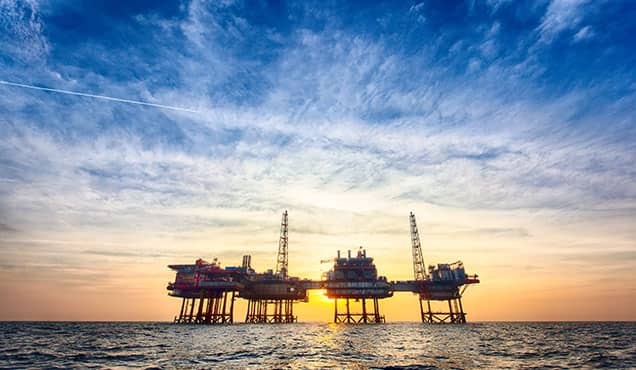 This will bolster the upstream opening over the longer term – regardless of any restrictions that may be applied toward international oil company (IOC) investment following the seating of a new presidential administration in December 2018. In the meantime, IHS Markit expects the authorities to expand and accelerate E&P opportunities through the end of this year. Upcoming auctions – Round 3.1 (shallow water) and Round 3.2 (onshore), currently scheduled for March 2018 and July 2018, respectively – could be adjusted to include new areas based on investor feedback. PEMEX will likely continue seeking upstream partnerships over this year due to the real possibility of a scale-back or halt on new upstream investment opportunities. The NOC is expected to ramp up its farm-out offerings to coincide with forthcoming bid rounds. Farm-outs provide a critical vehicle through which PEMEX can generate near-term cash flows from asset sales while reducing its own capital exposure. Farm-outs also hold the promise of longer-term benefits including knowledge transfer from qualified partners and future discoveries enabled through external capital and expertise. 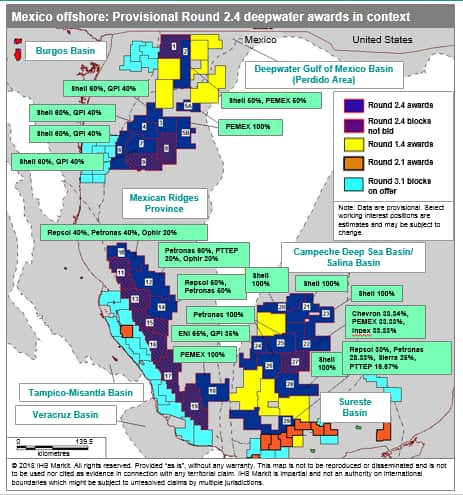 For onshore areas, large opportunity sets consisting of bid rounds and farm-outs – particularly in the resource-rich Burgos, Sureste, Tampico-Misantla, and Veracruz Basins – could also help Mexico diversify its competitor landscape and further enshrine the longevity of the upstream reform. According to Mexico’s energy secretariat, the Tampico-Misantla Basin alone holds roughly 18.4 billion barrels of oil equivalent (boe) in remaining volumes weighted heavily toward oil. The government estimates the basin’s total prospective resources at approximately 22 billion boe – reflecting long-term upside potential from largely unexplored unconventional plays. 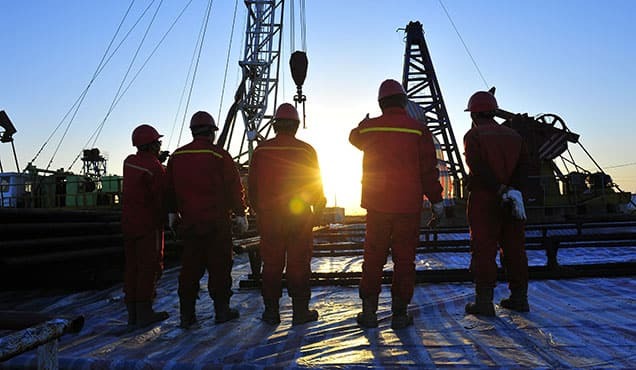 Despite the scale of Mexico's onshore resource opportunity, there are non-technical above-ground risks inherent to the country's onshore areas that present unique challenges to E&P. 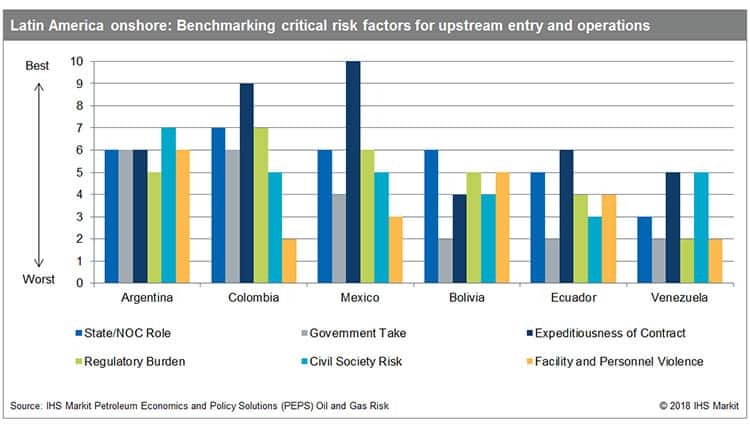 IHS Markit Petroleum Economics and Policy Solutions (PEPS) Oil and Gas Risk analysis suggests that Mexico is currently competitive within Latin America for onshore upstream entry terms and conditions (as measured by the following risk factors: State/NOC Role, Government Take, and Expeditiousness of Contract). However, Mexico is less competitive within the region for onshore upstream operations (as measured by the following risk factors: Regulatory Burden, Civil Society Risk, and Facility and Personnel Violence) due to challenges associated with local communities and violent risks. 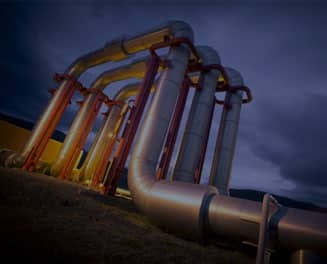 With respect to physical security challenges, PEMEX reported 10,363 illegal pipeline "taps" or instances of siphoning for the entirety of 2017 – breaking the record of 6,537 such taps for 2016. The NOC estimated financial losses due to fuel theft at roughly USD1.5 billion for 2016. In January 2018, PEMEX's chief of installations security for the Salamanca zone in Guanajuato state was shot and killed, underscoring the violent risks facing oil-sector personnel. Unlocking Mexico's onshore potential will require upstream terms and conditions that account for the country's onshore above-ground risks. Mexico has already taken important steps in establishing a regulatory framework for unconventional resources, reducing regulatory uncertainty for investors. 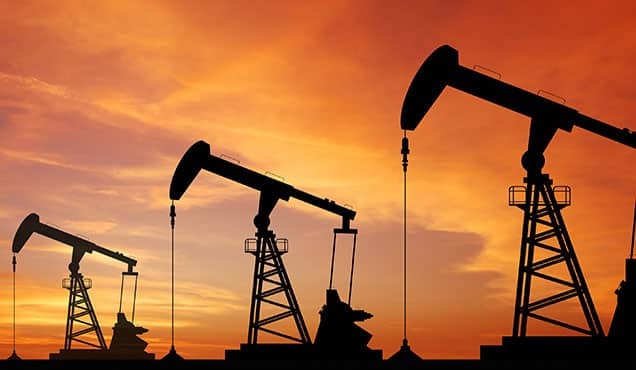 Going forward, officials will likely group PEMEX's farm-out blocks into large clusters to optimise the scale of the offering, boost associated investments, and augment revenues from the asset sales. Authorities will also likely limit PEMEX's equity stakes in onshore joint ventures to facilitate favourable project economics. This approach could help to at least partially offset above-ground obstacles specific to onshore areas. 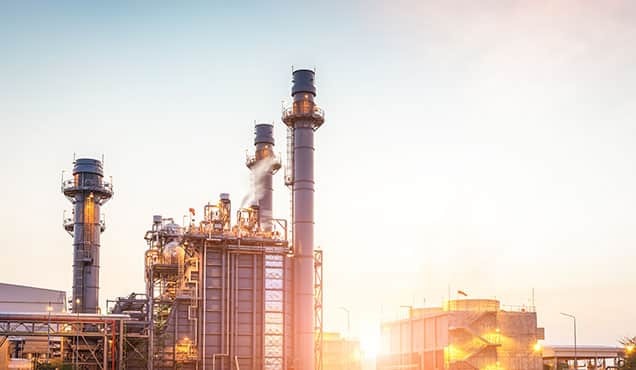 Discover cross-fuel offerings that integrate IHS Energy analysis and forecasts of the power sector, oil markets, global gas and climate and carbon strategies from our unparalleled research teams. Ford Tanner is a Principal Research Analyst in the Country E&P Terms & Above-Ground Risk capability at IHS Energy. Michael Dyer is an Upstream Technical Research Director and Advisor. He is responsible for the upstream content of Brazil, Mexico, Paraguay and Uruguay.